The beauty of Instagram is the innovative nature of this platform. With valuable additions, the app’s developers constantly expand their existing array of options for retailers. For instance, they recently added the Checkout on Instagram option for retailers. This is without even starting to discuss cutting edge features such as Instagram stories and Swiping up. Precisely because of this fertile ground for business, you need to rely on much more than the network itself. To truly capitalize on Instagram’s options for retailers, you need to use tools. Some of them bring you valuable data, while others can automate your most “annoying processes. Follow social trends and use these 9 essential Instagram marketing tools. It’s easy, you will see. 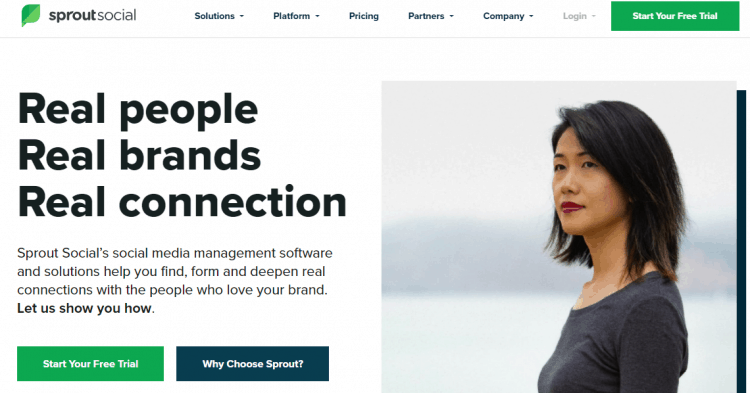 One of the most important tools for Instagram marketing, Sprout Social gives you the opportunity to effectively manage multiple Instagram accounts at once. You don’t to just monitor activity and interactions, but you also get to learn what are the best moments to post your content. Another valuable perk of Sprout Social is the scheduling options. Theoretically, you can queue your posts forever and don’t worry whether you are behind schedule or out of time. For bigger campaigns, a practical Instagram management tool is essential. Use ViralPost with it for maximum targeting. The days when hashtags were solely a Twitter thing are long gone. Instagram mostly exists and functions based on different hashtags. While they may get buried by other features for Instagram marketing, hashtags must not be pushed aside. According to one study, 70% of Instagram hashtags are brand associated and have sales as a priority. Hashtags for Likes lets you analyze the most popular hashtags in your particular niche. There is a number of different topics, and you can calibrate the popularity according to different time periods. For Instagram-oriented brands, there is nothing more effective than well-designed and well-targeted campaigns. They allow you to expand brand presence and reach the right people at the right time. If your brand is not at the top of the game, you need to save every cent you can possibly keep. Therefore, Simply Measured gives you a platform to gather and utilize different Instagram-related metrics. With enough data, you will know how each of your campaigns performs and what makes people react to particular aspects. There are both free and premium options. It’s not just about how you target your audience – image quality greatly affects your overall branding. Small, grainy or badly compressed images can give your brand a bad look, especially when dealing with new customers. To help you resize and modify your images, Landscape only uses several tools to make good images into great ones. There is so much more than mere resizing, too. You can transform one image into multiple ones, for the so-called “mosaic posts.” Landscape is also great for other forms of social media due to its sharing options. Most brand managers and marketers are aware of the benefits of MailChimp for email marketing. We should never forget the significance of this method of approach, but MailChimp is so much more. Not many people know that it comes with its own Instagram tools, ones that can help your marketing greatly. You can use the platform to build social media followings, with the Find tool. It lets you track customers similar to ones that follow your pages. This allows for better targeting and a much more efficient allocation of funds. Instagram employs simple math to show you how successful you are. The more followers you have, the higher the chances for outreach and scoring conversions. While PPC campaigns and keyword insertion are indeed important, you want to grow your pool of organic followers. Social media marketers are still puzzled as to how to increase their following. With CrowdFire, you boost your audience effectively. The tool connects you with accounts you desire and effectively follows the people you do. It’s also good for B2B marketing. The difference between good and great photo editing tools isn’t the image quality. Almost every company can effectively develop an app that can bring your photo to a perfect state. What sets them apart is the ease of use. And precisely because of this factor, VSCO emerged as the world’s leading photo editing app in 2013. It gives you a mini Photoshop on the go. You can sharpen your images, change the color balance or anything else you want. Every marketer should use the app to finalize projects and do final edits before they launch a campaign. A relatively new tool, Preppr lets you utilize the power of location for enhanced Instagram marketing. The crux of this useful aid is to improve geotagging and the effects of location on your followers. Using complex algorithms, Preppr analyzes the frequency of check-ins at a certain location and gives you the biggest chance to end up on the Featured list. The more people see you at the top of their location, the more organic followers you’ll get. Use Preppr at different locations for maximum efficiency. There is also an array of post scheduling options. If you’re going to master Instagram, why stop there? Instagram’s father company – Facebook, is known to experience a shared pool of users between Instagram. If your posts are blowing up on your Instagram feed, it’s time to capitalize on the opportunity and enter the Facebook sphere. For successful campaigns, you can use Facebook Power editor to effectively target your audience and mass edit photos. Visual campaigns are on the rise on Facebook. This is your ideal chance to create a multichannel brand presence. Instagram marketing is much easier if you rely on these tools. Through analytics and automated campaigns, you can post a myriad of visual content to reach your target audience. Instagram tools allow every marketer to make their good content even better and correct even the most minor mistakes. Implement them correctly and you will see instant growth. Becky Holton is a journalist and a blogger at Paperwritingpro.com, UK Assignment Holic. She is interested in education technologies, best essay for you and is always ready to support informative speaking at essay shark, nerdy writers. Follow her on Twitter.